I suppose there may come a day when I will become the ultimate Miles Teller fan. But today is still not that day. I can't quite pinpoint what it is about him that fails to draw me in, but it may have something to do with his lack of charisma. I just can't seem to distinguish him from, say, any other white young male actor under the age of 30. 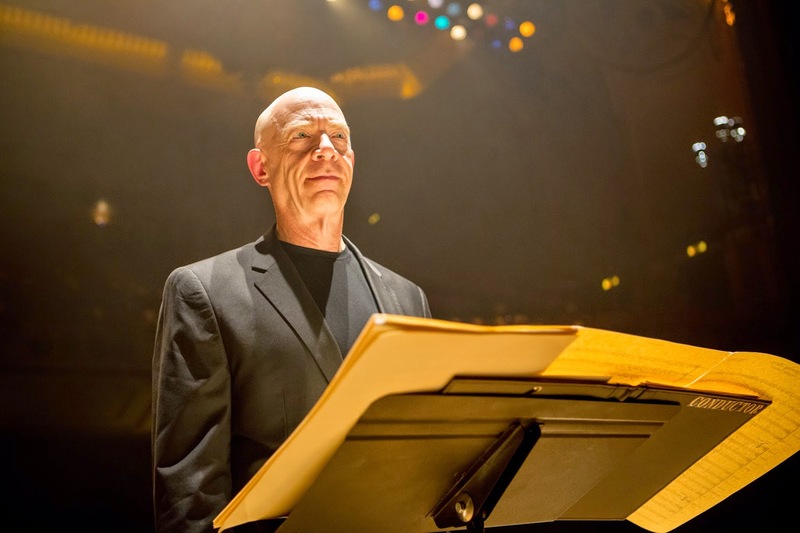 That said, going into his new film WHIPLASH I had two thoughts on my mind: 1) I wonder if this film will finally make me change my mind about Teller, and 2) If not that, I hope this is the film that finally gives J.K. Simmons the recognition he deserves. While WHIPLASH may not have accomplished that first goal, I think it definitely conquered the latter. Or so I hope. In the film written and directed by Damien Chazelle (Grand Piano, The Last Exorcism Part II), Teller plays Andrew, a young jazz student at the prestigious fictional Shaffer Conservatory of Music in New York City, who's on the cusp of becoming the next Charlie Parker. Except for the fact that his new music teacher--the renowned Terrence Fletcher--is like a character ripped out of a Stephen King novel. Terrifying, manipulative and yet strangely mesmerizing, Fletcher (Simmons) berates and antagonizes to his own admission solely to achieve the highest potential from each student. So, in other words, Fletcher is like the evil version of a life coach. Just as much of a caricature, but in the hands of Simmons he ends up being the most compelling character in the film. In fact, I kinda wish the story was told in his point of view. While Teller's intimidated yet driven portrayal is effective and will undoubtedly resonate with some audiences, Simmons' complex performance of a man at war with his own humanity, grappling with the reality that neither he nor the students he teaches are in fact the next brilliant jazz musician, is simply gripping. But, alas, Chazelle spends most of the time focusing on Andrew's less interesting story--growing up raised by a single father (Paul Reiser) who, despite his best intentions, never truly supported his son's musical passion, and being a socially awkward yet determined young man who becomes easy prey for someone like Fletcher. As a character who's part contemptuous father figure and part frustrated genius, Simmons eclipses each scene he's in, consuming the power of a man whose commanding presence literally reduces even the most confident students to tears. Until he zeroes in on Andrew, a pet project/protege in whom he's discovered a particular vulnerability that he could use to his advantage. Unlike the humanly flawed Glenn Holland played by Richard Dreyfuss in Mr. Holland's Opus, Fletcher is maniacal and hard to connect with. Even when Chazelle provides a softer scene with Fletcher having an emotional moment during which we see the man behind the terror, it lasts but only a few minutes before he quickly reverts back to being a closed shell of a person. But the scene is so intriguing that it leaves the audience questioning what else about Fletcher is Chazelle hiding. What about his family, his personal life, his childhood dreams? Why introduce the audience to a side of him that is never fully explored, or even to provide us with more insight on the character. Though Fletcher is at times one dimensional, Simmons is impressive in making us see a certain side of him that may or may not have been in the script--if only for a moment. But even with all the verbal, emotional and indirectly physical abuse Fletcher inflicted on Andrew, WHIPLASH still left me empty and wanting much more. Simmons effectively brings an intensity to each wonderfully lit scene, and the music is aptly sublime, But WHIPLASH leaves me with an overwhelming sense of blahness as it eludes a point in its attempt to overdramatize and showboat its way to the ending credits. The film has potential, but ultimately there's more bark than bite. 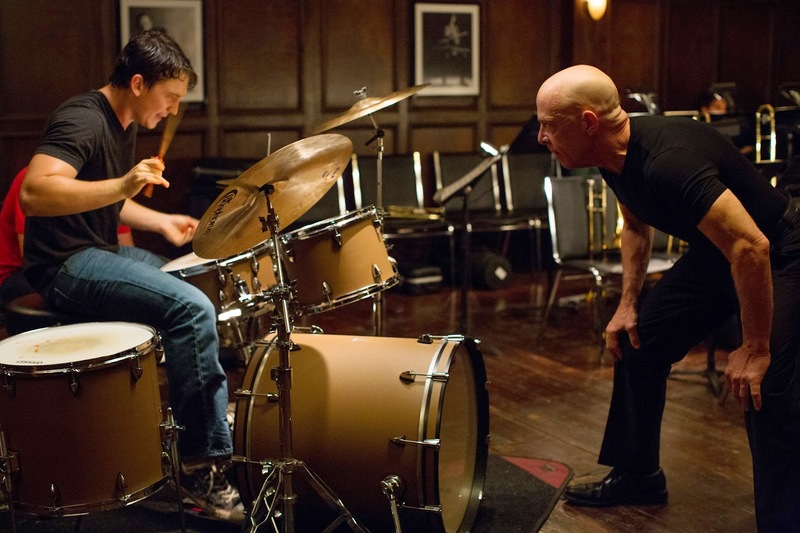 WHIPLASH is in theaters Friday, October 10th. I really enjoyed this film, it reminded me of Dallas Buyers Club in the sense that the performances are the main thing that elevate it from your typical television movie of the week. Granted this film has far better editing and sound design than Buyers Club did. I can admit that the plotting is one long set up for that sensational ending, but the Teller/Simmons dynamic won me over. Simmons is the glue that really holds the whole production together. I liked the fact that he was the anti-Holland in many ways. Truth be told, I was never a fan of Mr. Holland’s Opus. Even in Simmon’s calm moments, his villainous ways are always bubbling just underneath the surface. The whole film is shot through the eyes of Andrew. Think of it as a diary. For that reason, it would make the narrative incoherent to say more about Fletcher. The key part in Fletcher's "emotional moment" is that he is lying: talking about a car crash when in fact it was a suicide. The film is a Faustian tale. Hard to think of anything else quite like it in its brutal virtuosity.